The program provides students who are members of their respective Catholic campus ministries with the opportunity to learn about the role of the Church in the public square and how Catholic social teaching is applied to public policy. After an informational session in the morning, students spent the remainder of the day at the capitol touring the building, meeting with lawmakers, and watching the legislative process in action. The day concluded with Mass at the Co-Cathedral of St. Thomas More. 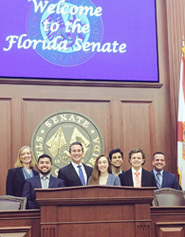 Students were welcomed to the floor of the Senate chamber by Senator Rene Garcia (District 36, Hialeah) and visited with Representative Erin Grall (District 54, Vero Beach) in her capitol office. Both lawmakers spoke of how their Catholic faith inspires their civil service and their desire to work to ensure Florida&apos;s laws protect and serve our state&apos;s most vulnerable residents. Prior to lunch, the students joined others who work in and around the capitol to pray the rosary in the capitol&apos;s Heritage Chapel. Students involved in the liaison program were urged to share their experience and the knowledge they gained on the work of the FCCB with their ministry peers. 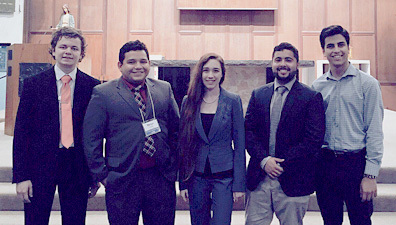 They were also asked to encourage their peers to connect with the Florida Catholic Advocacy Network as a means to stay informed on the Church&apos;s ongoing engagement in the policy arena and to receive calls to action that advise constituents to contact their lawmakers on specific policy proposals under consideration.